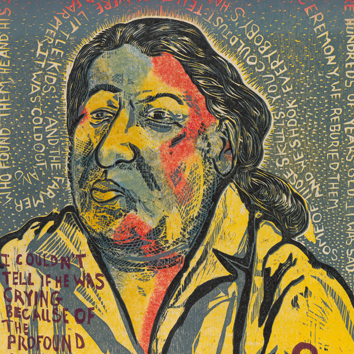 In Our Own Words: Native Impressions 2015-16 features a series of prints intended to highlight the life experiences of Native Americans living in North Dakota today. Daniel Heyman, whose previous work dealt with provocative social and political issues, collaborated with Lucy Ganje, who has family ties to tribal nations in North Dakota, to produce the portfolio under the guidance of master printer Kim Fink. The two artists listened to members of North Dakota’s four remaining tribal nations talk about their personal and family histories. 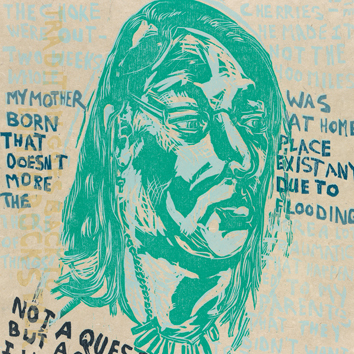 The series of 26 prints on handmade paper is made up of twelve pairs of portraits and broadsides that include excerpts from these interviews, plus a title page and colophon. 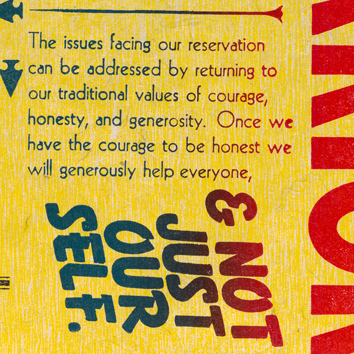 In Our Own Words: Native Impressions 2015-16 is organized by the Virginia Museum of Fine Arts and curated by Dr. Johanna Minich, VMFA’s Assistant Curator of Native American Art. It will be on view in the Taubman Museum of Art’s Bank of America Foundation/Dominion Resources Gallery from July 21, 2018 - January 13, 2019.